Instead of the title I chose, I thought about using the following title for this blog post: "Tuck in your shirt!" Pictured above is Roger J. 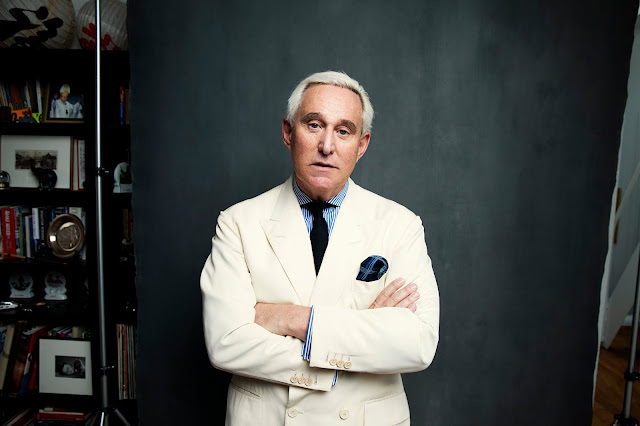 Stone, Jr., whom The New York Times identifies as a "Trickster Who Is Right Where He Wants to Be." That's the hard copy version, of course. The online version of the article has a slightly different title. You can see more evidence of Stone's sartorial sensibilities by watching the video of Stone's appearance at The New Yorker Festival in 2016. If you click the link, you can see a video of Stone, and others, discussing "What Would a Trump Presidency Look Like?" The discussion documented in this video took place on October 8, 2016, exactly one month before the presidential election. Stone is impeccably dressed - far better than the other panelists. I was in the audience, and noted, very particularly, what a sharp dresser Stone was. I also heard him brag, during this appearance, about the upcoming WikiLeaks releases that would damage the Clinton campaign, very late in the campaign season. Later on, Stone claimed to have no insider knowledge. That was definitely not the impression Stone gave to the audience at The New Yorker Festival, and as it turns out, Stone subsequently lied under oath about his supposed lack of inside knowledge - at least that is what the Special Counsel says. Like many, I am waiting to see whether any "collusion" between the president and Russia is ever documented so clearly that an impeachment of the president would be appropriate. Whether or not that kind of proof is ever forthcoming, the article that ran in The Times yesterday definitely shows that lots of those associated with Trump have lied about what happened in the 2018 presidential campaign. There is a little "chart" in the article, showing the connections. Stone is there, as are Paul Manafort, Michael D. Cohen, and others. Everyone shown in the chart has been convicted of a crime, except Stone and Konstantin V. Kilimnik, who is now in Russia and thus not susceptible to immediate prosecution. Pundits (on the left, admittedly) are saying that a "coverup" of the Trump campaign's collusion with Russia will soon be proven. Things are coming "undone," they say. 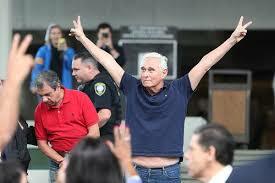 I will wait for actual proof, myself, but in the meantime, the fact that Stone is coming "undone," and isn't "covering up" anymore, letting his underbelly hang out as he makes his pronouncements of innocence, seems like some kind of metaphor to me, some kind of indication that lies and mendacity are coming to light! Let no stone be left un-turned...and then perhaps interred.